Black Caucus members gather on the House floor Monday night. BATON ROUGE–Emotions were raw Monday night as the special session collapsed after the the Legislature was unable to raise major revenue to fund the state’s budget priorities. In the final minutes of the session, an attempt to reconsider a bill that would have increased revenue by $504 million was blocked by Rep. Alan Seabaugh, R-Shreveport, who acknowledged that he stayed at the microphone to use up the remaining time allotted for the session. “We can’t let two people dictate the whole process,” he added. “We’ve got a bully that runs Appropriations. We’ve got a bully that runs the delegation, and unfortunately my Republican colleagues don’t have the gumption to stand up to him. We allow two people to bring us down in the trash, and that’s unfortunate.” Rep. Katrina Jackson, D-Monroe, said she felt Seabaugh’s actions were not fair to the people of Louisiana. “There were some Republicans and Democrats that came together at the end, to put the people first, and one Republican went to the mic and filibustered,” Jackson said, “which means we have to come back in the special session and spend about $500,000 more of the people’s money with the same options of bills on the table.” “We came in the session and only raised $30 million with a $600 million deficit. This is not putting the people first,” she added. Not everyone was disappointed with the night’s outcome. A Twitter account called LA Conservatives (@laconservative_) thanked House Republicans for “fighting on behalf of middle class voters.” The account also retweeted someone’s else tweet that read “Alan Seabaugh is my hero.” Rep. Rob Shadoin, R-Ruston, was so frustrated with the night’s proceedings, he said he did not even think the governor should call another special session. “If I were the governor, I wouldn’t call one,” Shadoin said. “We’ve done this seven times out of nine sessions, what’s the use? I think if I were the governor I’d tell this House, ‘Okay, you want a special session? 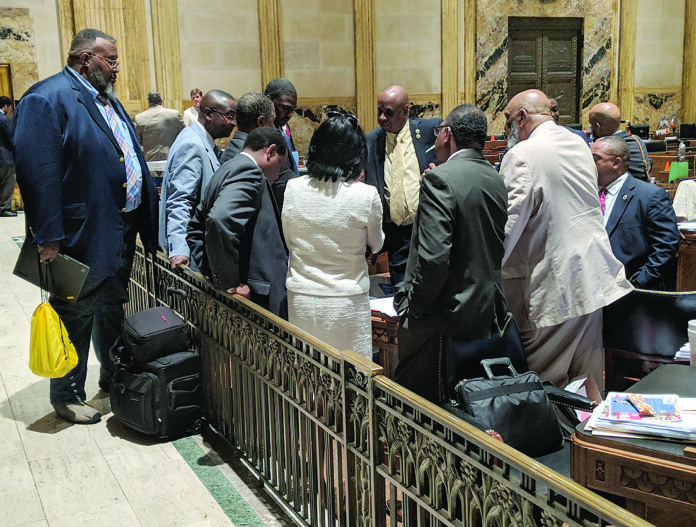 You call yourselves into it.’” Rep. Malinda White, D-Bogalusa, echoed a similar sentiment after the governor’s press conference following the end of the session. White said she thought the legislators should give up their salaries for the next special session and put them toward the deficit. She said that maybe that would teach them a lesson.